Girls Wear Blue Too: What is a Crochet Mood Blanket? What is a Crochet Mood Blanket? What exactly is a crochet mood blanket? The 2014 crochet mood blanket movement was started by Stacey Wentford-Hall and it is hosted through a Facebook group which currently has just over 3500 members from across the world. Stacey's idea is that you crochet a square or stripe each day in colour that reflects your mood or alternately you could choose to make a square or do a stripe each week. I'm handling this slightly differently in that I am doing hexagons, yes my love affair with the basic crochet Hexagon continues and I haven't allocated a group of colours to co ordinate with particular moods, I choose a colour that I feel like using and that fits in with the surrounding colours each day, sometimes twice a day. 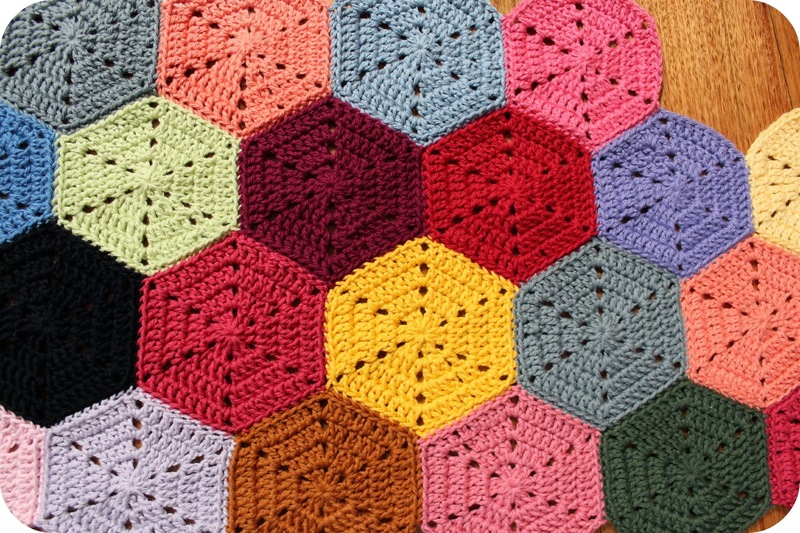 My plan is to have a finished blanket that is at least 18 x 18 hexagons, it will sit on top of a queen sized bed. I am using a combination of Morris and sons Avalon 8 ply Pima cotton ( 106m for $8.50) and Bendigo woollen mills 8 ply cotton. ( 485m for $13.00) The Morris and sons is a gorgeous yarn and worth the price in my humble opinion, it has a beautiful sheen and colour depth and holds the hexagon shape so well. The Bendigo cotton is out shone by comparison in the performance stakes but its stellar redeeming quality, especially for a project of this size, is its value for money. 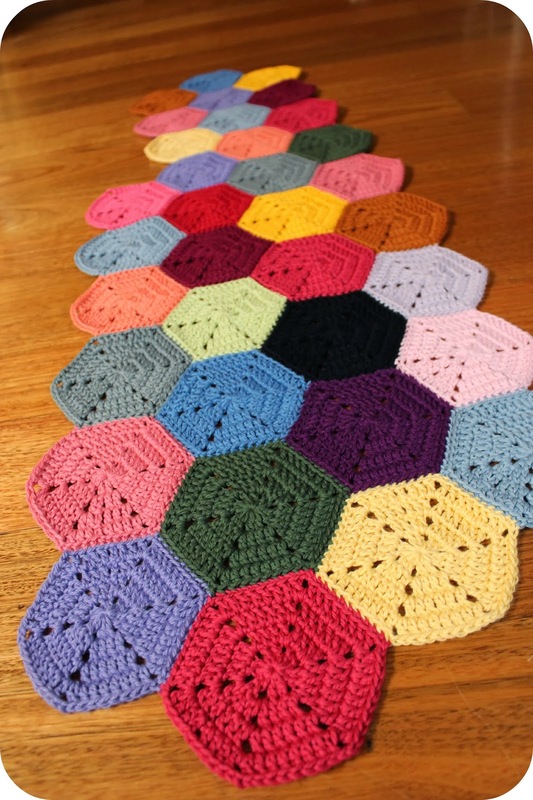 I have 35 hexagons and a 36th will be added today so I am a little ahead of a 'square' a day. I only committed to a square a week and aimed for a square a day but do note that if I keep going with one each day I'll have something nice and snugly to work under as it progresses through winter, I really yearned to have something like this on the go last year. If I only do a square a week this could turn out to be the longest WIP ever! I do think one a day is totally achievable and doing a few extras here and there is beneficial for me as there will be days once School starts that I might not pick up my hook at all. I love your Hexagons! it is going to be a beautiful blanket! It looks lovely and very colourful, Tammy. I also hadn't heard of a mood blanket before and it is a good idea.